The veins return blood from the extremities and the vital organs to the heart. The wall of the vein is thin and this makes it susceptible to compression from other structures lying close to it. Fortunately, the anatomy of the human body is so intricately designed that it does not happen very often. However, occasionally abnormal anatomical development of adjoining structures can put pressure on the vein wall from the outside. This can in turn affect the flow of blood through the veins and cause clot formation within the vein and also scarring of the vein wall. May Thurner Syndrome and Nutcracker Syndrome are examples of venous compression and are discussed below. What is May Thurner Syndrome or Iliac Vein Compression Syndrome? In this condition, the main venous outflow from the left lower limb (left common iliac vein) is compressed by the artery supplying the Right lower limb (Right Common Iliac Artery). What are the symptoms of May Thurner Syndrome? Some of the investigations which may help in the diagnosis are Duplex ultrasound scan and a CT scan. Anticoagulation will help reduce the risk of clot formation in the vein. Your doctor will give you advice and instructions on monitoring the effectiveness of these blood thinners. Thrombolysis is a treatment option that is available in cases where DVT affects the iliac veins. The thrombolytic agent which is a medication that breaks down clot is administered via a catheter (a small plastic tube) placed directly into the clot. The medication will start dissolving the clot immediately although it may take a few hours for completion. In addition to thrombolysis, the narrowed vein may also require further treatment with balloon angioplasty and stent. Angioplasty and stent is a minimally invasive technique whereby the iliac vein that is compressed by the iliac artery is widened with the help of a balloon mounted at the tip of a catheter. This allows the blood to flow freely and the vein wall is reinforced with a stent (a metal scaffolding) which prevents the artery from compressing the vein. Nutcracker Syndrome is another rare example of venous compression. Here, the left renal vein which drains the blood from the left kidney is compressed like a nutcracker between the abdominal aorta behind and the Superior Mesenteric artery in front. 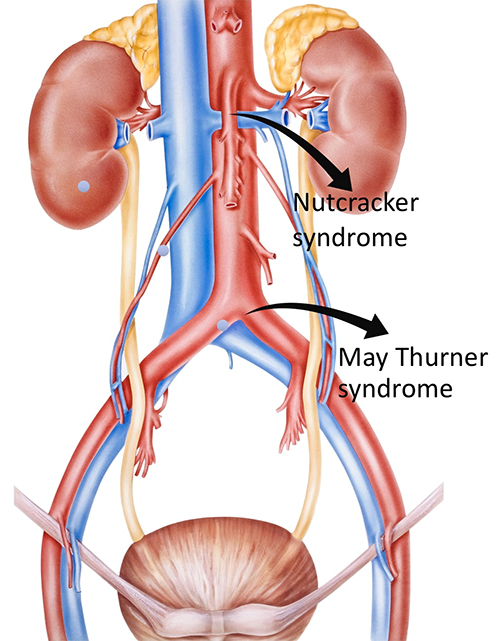 What are the symptoms of Nutcracker syndrome? This is a rare condition and diagnosis may often be delayed and only made after extensive investigations. Patients may experience abdominal pain and haematuria (blood in the urine). The abdominal pain is usually described along the left lower back and sometimes in the lower abdomen in the pelvis. Men may experience pain the testicles and women along the left lower abdomen. 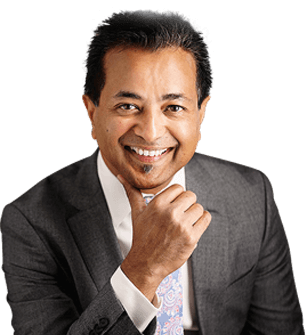 Occasionally it may also be associated with varicocele (small varicosities in the scrotum) and also varicose veins in the legs. How is it diagnosed and what are the treatment options? The diagnosis of this rare condition as mentioned earlier is often delayed. Your doctor will take a through history and examination and order some investigations. A CT scan and occasionally a Venography may be required. Endovascular stenting is a keyhole procedure. Here the renal vein that is compressed between the arteries is reinforced from the inside by a stent (a metal scaffolding). This in-turn prevents the compression of the vein between the arteries. Open Surgery involves accessing the renal vein through an incision in the abdomen. The renal vein that is squashed between the artery (SMA) and aorta is divided where it joins the Inferior Vena Cava (a large vein into which the renal vein drains). It is then reattached to the Inferior Vena Cava 2-5cm below so as to avoid further compression.